Russian Hebrew journalist; born in Samostye, Lublin, 1816; died in St. Petersburg 1893; founder and editor of "Ha-Meliẓ," and other periodicals published in the Russian and Yiddish languages. A son of poor parents, he was in his early youth apprenticed to a tailor, but through energy and assiduity he succeeded in acquiring a knowledge of Hebrew literature, and of the Russian, Polish, and German languages. He married in Lublin, and in 1840 left his native town for Odessa, then the "Mecca" of the Haskalah movement. He obtained there a commercial position, made the acquaintance of the Maskilim of the city, and in his leisure hours continued to work for his self-education. Later he opened a clothing-store, and was himself cutter in his tailoring-shop. 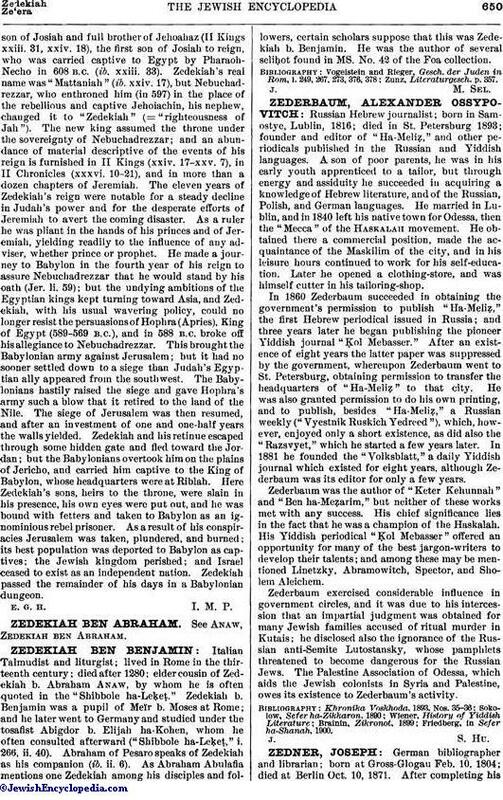 In 1860 Zederbaum succeeded in obtaining the government's permission to publish "Ha-Meliẓ," the first Hebrew periodical issued in Russia; and three years later he began publishing the pioneer Yiddish journal "Ḳol Mebasser." After an existence of eight years the latter paper was suppressed by the government, whereupon Zederbaum went to St. Petersburg, obtaining permission to transfer the headquarters of "Ha-Meliẓ" to that city. He was also granted permission to do his own printing, and to publish, besides "Ha-Meliẓ," a Russian weekly ("Vyestnik Ruskich Yedreed"), which, however, enjoyed only a short existence, as did also the "Razsvyet," which he started a few years later. In 1881 he founded the "Volksblatt," a daily Yiddish journal which existed for eight years, although Zederbaum was its editor for only a few years. Zederbaum was the author of "Keter Kehunnah" and "Ben ha-Meẓarim," but neither of these works met with any success. His chief significance lies in the fact that he was a champion of the Haskalah. His Yiddish periodical "Ḳol Mebasser" offered an opportunity for many of the best jargon-writers to develop their talents; and among these may be mentioned Linetzky, Abramowitch, Spector, and Sholem Aleichem. Zederbaum exercised considerable influence in government circles, and it was due to his intercession that an impartial judgment was obtained for many Jewish families accused of ritual murder in Kutais; he disclosed also the ignorance of the Russian anti-Semite Lutostansky, whose pamphlets threatened to become dangerous for the Russian Jews. The Palestine Association of Odessa, which aids the Jewish colonists in Syria and Palestine, owes its existence to Zederbaum's activity. Friedberg, in Sefer ha-Shanah, 1900.